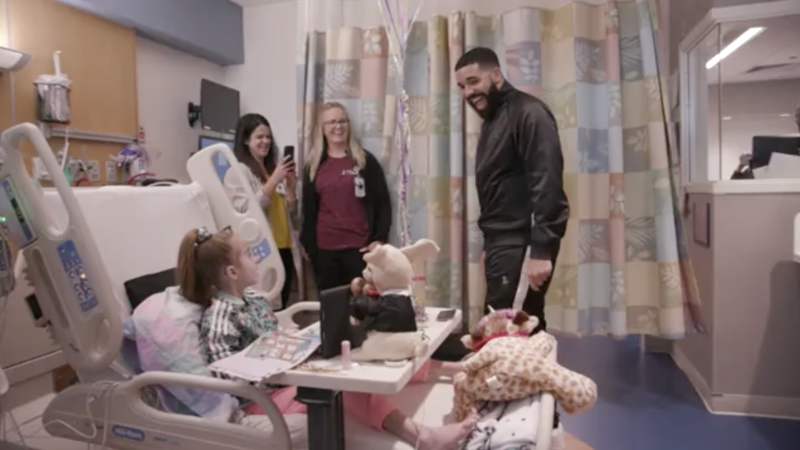 Eleven-year-old Sofia Sanchez is "in her feelings" about Drake, who made a surprise visit to the girl's hospital room Monday. Sanchez is awaiting a heart transplant at Ann & Robert H. Lurie Children's Hospital of Chicago. She is diagnosed with cardiomyopathy, a condition that often leads to heart failure. Three weeks ago, Sanchez received open heart surgery and while she was recovering, she decided to do the "Kiki Challenge." She filmed the dance in the hospital hallway, with an IV attached to her arm and a smile on her face. The video of Sanchez dancing to Drake's song, "In My Feelings," got back to the rapper. Social media users encouraged him to visit the girl, and he decided to make the trip to Chicago. When he pulled back the curtain dividing Sanchez's hospital room, she was speechless. "Right when he came in I was like, 'Oh my God.' And I never pictured him that tall," Sanchez said in a video produced by the hospital. "I didn't talk for a minute. I was like, 'Is this real or fake?'" The video shows a stunned Sanchez, who eventually screams "Oh my God!" when she realizes it is, indeed, Drake. She then jumps out of her hospital bed and wraps him in a hug. The hospital's video of the surprise has received over 50,000 views on Facebook. It goes on to show Drake and an ecstatic Sanchez talking and taking photos in her hospital room. Drake and Sanchez talked about her other favorite Canadian, Justin Bieber, as well as basketball, the rapper wrote on Instagram. He took several photos with the 11-year-old, sharing two on social media. He also signed autographs for her and gave her merchandise from his latest album, "Scorpion." Donning a "Scorpion" hat, Sanchez described the moment she met her idol, just two days after her 11th birthday. "It's a miracle. Because it's one of the first wishes I got in a long time ... I wanted him to come cheer me up for my birthday this weekend," she said. "This is the best birthday present I ever had." Drake not only made Sanchez's birthday wish come true, he took her mind off of her heart condition for a while. And it seems she made a lasting friend. Her parting words for the rapper: "Talk to you on FaceTime!"